Ready for a Book Adventure? Welcome to The Book Gallery in Sparks, Nevada. ​NORTHERN NEVADA'S OLDEST USED BOOK STORE! 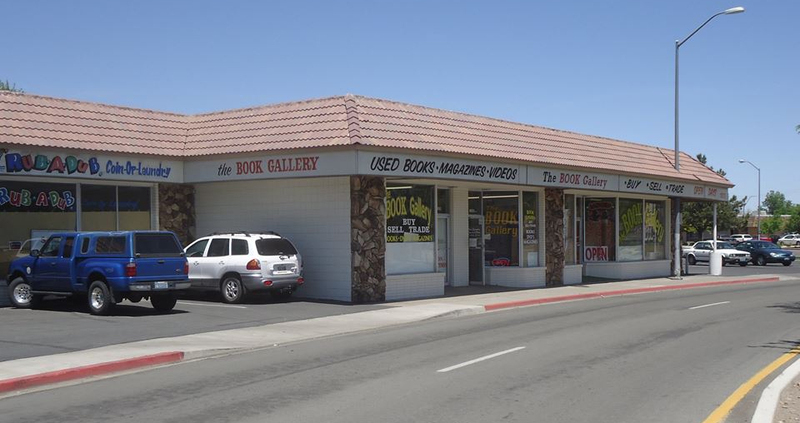 The Book Gallery has been serving the Reno/Sparks Area for 26 years, as one of the leading book stores in the area. With 3000 square feet of retail space, we have books, comics, CD's, DVD's and magazines--one of Northern Nevada's biggest selection. Weighing in at 150,000+ books we have it all! We have a HUGE selection of Americana and Silver State history. Our Science Fiction section is over 400 square feet--be sure to wear your space boots so you can reach the top shelf! And of course we carry Romance, Westerns and all sorts of educational and historic material! Want to learn something new? A foreign language, how to fix a car, how to hunt, shoot a gun or survive in the wilderness we have the books with the answers! Military books covering everything from World War I to the present. See our religious section: Christian, Wicca, Hindu, Buddhism, and beyond! With some of the best prices in town, we are a serious competitor! Come pick up comics for only $1.00, and magazines for only 99¢! All series DVD videos discounted to $4.00 each. We want your books! Bring 'em in! The shop has floor to ceiling books, well categorized, and the prices are great too. There are many racks in the different rooms and when I go there, its always with a sense of anticipation...what will I find today? It's all about the fun of the hunt.